Mummified remains of a prominent Buddhist master have been discovered inside a bronze statue of Buddha. It's believed that the mummified remains are that of Liuquan, a famous monk who lived over a thousand years ago and was a prominent member of the Chinese Meditation School. 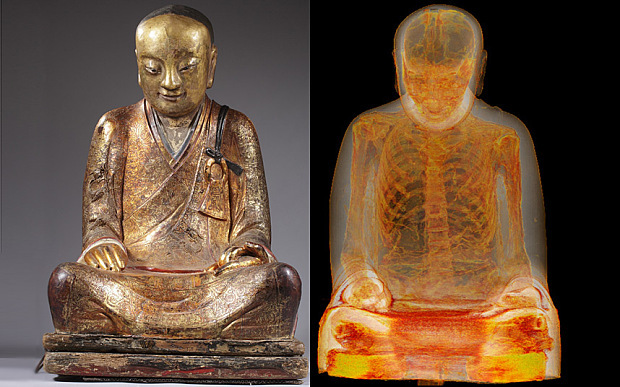 While researchers were already aware that there was a mummy hidden within the statue, a CT scan revealed the identity of the monk along with the revelation that his organs had been removed and his body had been encased with ancient scrolls. The International Business Times reports that some Buddhists believe these mummified remains are monks who have reached a truly advanced state of meditation. By living off a specially chosen diet and practising strict meditation for many years it's believed that some monks can become the Buddha reborn. The scan was carried out by researchers from the Drents Museum at Meander Medical Centre in the Netherlands. Following the scan, the statue will now go on display at the Hungarian National History Museum until May 2015.